Not to be confused with Westo. This article is about historical Mesoamerican peoples. For modern day Chichimeco people, see Chichimeca Jonaz. For the genus of moth, see Chichimeca (moth). Map of the location of prominent Chichimeca peoples around 1550. Map only reflects core areas, as these tribes moved freely back and forth from what is now southern Utah and had definite settlements in what is now Texas. Chichimeca (Spanish [tʃitʃiˈmeka] (help·info)) was the name that the Nahua peoples of Mexico generically applied to nomadic and semi-nomadic peoples who were established in present-day Bajio region of Mexico. Chichimeca carried the same sense as the Roman term "barbarian" to describe Germanic tribes. The name, with its pejorative sense, was adopted by the Spanish Empire. For the Spanish, in the words of scholar Charlotte M. Gradie, "the Chichimecas were a wild, nomadic people who lived north of the Valley of Mexico. They had no fixed dwelling places, lived by hunting, wore little clothes and fiercely resisted foreign intrusion into their territory, which happened to contain silver mines the Spanish wished to exploit." In modern times, only one ethnic group is customarily referred to as Chichimecs, namely the Chichimeca Jonaz, a few thousand of whom live in the state of Guanajuato. The Chichimeca people consisted of eight nations that spoke different languages. As the Spaniards worked towards consolidating the rule of New Spain over the indigenous peoples during the sixteenth and seventeenth centuries, the Chichimecan nations resisted fiercely, although a number of native groups of the region allied with the Spanish. The most long-lasting of these conflicts (1550–91) was the Chichimeca War, resulting in the defeat of the Spanish Empire and a decisive victory for the Chichimeca Confederation. 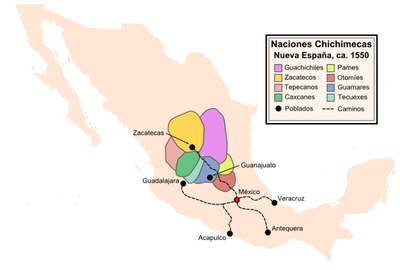 The Nahuatl name Chīchīmēcah (plural, pronounced [tʃiːtʃiːˈmeːkaʔ]; singular Chīchīmēcatl) means "inhabitants of Chichiman," Chichiman meaning "area of milk." It is sometimes said to be related to chichi "dog", but the is in chichi are both short while those in Chīchīmēcah are long, which changes the meaning as vowel length is phonemic in Nahuatl. Chichimeca military strikes against the Spanish included raidings, ambushing critical economic routes, and pillaging. In the long-running Chichimeca War (1550–1590), the Spanish initially attempted to defeat the combined Chichimeca peoples in a war of "fire and blood", but eventually sought peace as they were unable to defeat them. The Chichimeca's small-scale raids proved effective. To end the war, the Spanish adopted a "Purchase for Peace" program by providing foods, tools, livestock, and land to the Chichimecas, sending Spanish to teach them agriculture as a livelihood, and by passively converting them to Catholicism. Within a century, the Spanish and Chichimeca were assimilated. ^ This term caused confusion in later scholarship, as it was understood to refer to a specific ethnic group. ^ As cited in Gradie (1994). Andrews, J. Richard (2003). Introduction to Classical Nahuatl (Revised ed.). Norman: University of Oklahoma Press. Gradie, Charlotte M. (1994). "Discovering the Chichimeca". Americas. The Americas, Vol. 51, No. 1. 51 (1): 67–88. doi:10.2307/1008356. JSTOR 1008356. Karttunen, Frances (1983). An Analytical Dictionary of Nahuatl. Austin: University of Texas Press. Lockhart, James (2001). Nahuatl as Written. Stanford University Press. Lumholtz, Carl (1987) . Unknown Mexico, Explorations in the Sierra Madre and Other Regions, 1890-1898. 2 vols (reprint ed.). New York: Dover Publications. Powell, Philip Wayne (1969). Soldiers, Indians, & Silver: The Northward Advance of New Spain, 1550-1600. Berkeley, CA: University of California Press. Secretariá de Turismo del Estado de Zacatecas (2005). "Zonas Arqueológicas" (in Spanish). Smith, Michael E. (1984). "The Aztlan Migrations of Nahuatl Chronicles: Myth or History?" (PDF online facsimile). Ethnohistory. Columbus, OH: American Society for Ethnohistory. 31 (3): 153–186. doi:10.2307/482619. ISSN 0014-1801. JSTOR 482619. OCLC 145142543.